No joke there is an actual hurricane in this satellite image. 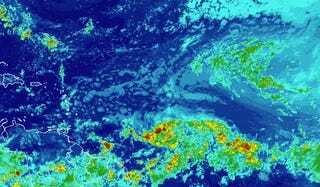 The first hurricane of Atlantic hurricane season is here. You just have to squint to see it. Hurricane Beryl formed early Friday as an impossibly small storm. Hurricane-force winds extend less than 10 miles from its core, and tropical storm force winds die after 35 miles. The indignities don’t stop there. The storm is packing 80 mph winds as of late Friday morning, enough to be a Category 1 hurricane. The swells associated with it are barely a blip, so there’s not even much motion in the ocean to go with this nano-sized storm. The first hurricane of the Atlantic season does have a few quirky superlatives, even if size and vigor are not among them. Beryl began as an African wave, which are areas of moderately organized low pressure. It’s officially the furthest east a wave has turned into a hurricane before August. The storm is also the second earliest hurricane to form in the tropical Atlantic on record. Its distinctly tropical lineage spares Beryl from the further ignominy of being labeled a neutercane, a now-retired term for storms with tropical and subtropical characteristics. In my heart, though, Beryl is definitely a neutercane. Right now, the storm poses little threat to land and faces a steep uphill battle to grow and intensify. The National Hurricane Center is forecasting that “tiny Beryl” will strengthen a bit on Friday and hang onto its hurricane status until Saturday. After that, it will gradually weaken to a tropical storm as upper level winds blowing out of the west start to attack it. The current forecast track takes Beryl over the eastern Caribbean islands as a tropical storm late Sunday night or early Monday morning. With such a small wind field, it’s unlikely to cause much storm surge or wind-related damage. Rain and other impacts will also likely be quite isolated. No matter how puny it is, though, it’s still worth keeping an eye on Beryl if you live in the region. That’s especially true since its diminutive size makes it hard to forecast, according to the National Hurricane Center. Puerto Rico also falls inside the cone of probability with storm impacts possible on Monday morning. Even a glancing blow from a tiny storm could disrupt the fragile power system on the island. We’re only two storms into Atlantic hurricane season, but it’s been a weird one. The first storm was Subtropical Storm Alberto, which then became a tropical storm over land and basically hit the Great Lakes. Now we have itty bitty Beryl forming in a weird place when all the conditions lined up against it. The odds of another tropical cyclone forming in the Atlantic are also pretty good this weekend. The National Hurricane Center gives an organizing area of thunderstorms a couple hundred miles off the coast from the Carolinas a 70 percent chance of turning into a tropical system in the next 48 hours. If attains tropical storm status, its name would be Chris. No word yet on what kind of freak it will be.